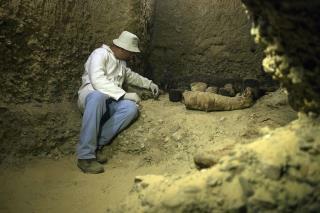 (Newser) – Egypt says it just made what Ahram Online calls its "first antiquities discovery of 2019," and it's a big one: a number of ancient burial chambers containing some 40 mummies at the Tuna El-Gebel necropolis in the desert province of Minya, south of Cairo, the AP reports. Officials told reporters at the site Saturday that the chambers, which were cut out of rock, belonged to a middle-class family that probably lived during the Ptolemaic, early Roman, or Byzantine period. The mummies are in good condition, and at least 10 of them had been children. Per Egypt Today, the mummies were covered with pieces of cardboard and crockery. Some were decorated with "demotic handwriting"—a form of ancient Egyptian script used by ordinary people. Papyri and colorful mummy cases were also unearthed. Egypt has made a series of archaeological finds recently, and it has been heavily promoting them to revive its tourism industry, a staple of its economy that was decimated by the chaos that followed its 2011 uprising. Rania Al-Mashat, the country's tourism minister, says the discovery shows the world that Egypt "has it all," per Ahram Online. Doubtful tourism will rep up anytime soon as too many Islamic radicals wanting to cut infidel heads off and no way to stop that since Allah demands it. Not sure why human nature never leave the dead alone. I'm going to do the cremation so I can be left alone.